Explanation: Mysterious Hanny's Voorwerp, Dutch for "Hanny's Object", is really enormous, about the size of the Milky Way Galaxy and glowing strongly in the greenish light produced by ionized oxygen atoms. It is thought to be a tidal tail of material left by an ancient galaxy merger, illuminated and ionized by the outburst of a quasar inhabiting the center of distant spiral galaxy IC 2497. 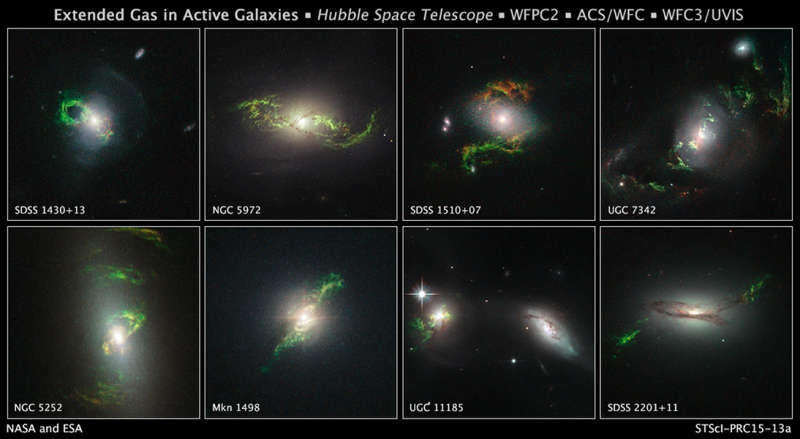 Its exciting 2007 discovery by Dutch schoolteacher Hanny van Arkel while participating online in the Galaxy Zoo project has since inspired a search and discovery of eight more eerie green cosmic features. Imaged in these panels by the Hubble Space Telescope, all eight appear near galaxies with energetic cores. Far outside their associated galaxies, these objects are also likely echoes of quasar activity, illuminated only as light from a core quasar outburst reaches them and ultimately fading tens of thousands of years after the quasar outburst itself has faded away. Of course a galaxy merger like the impending merger of our own Milky Way and the Andromeda Galaxy, could also trigger the birth of a quasar that would illuminate our distant future version of Hanny's Voorwerp.